The need to bring online a new fleet of nuclear power stations in the UK was stressed yesterday at an energy conference in London. Speaking at UK Energy 2014, organised by The Economist, power company bosses and climate change campaigners backed Britain’s drive to build eight new reactors, starting with EDF’s Hinkley Point C.
EDF is poised to make a final investment decision on Hinkley, which will be the first new nuclear power station built in Britain in 20 years. The final – and biggest hurdle – for the scheme to clear is an EU investigation into whether the government’s contracts-for-difference agreement with EDF complies with state aid rules. 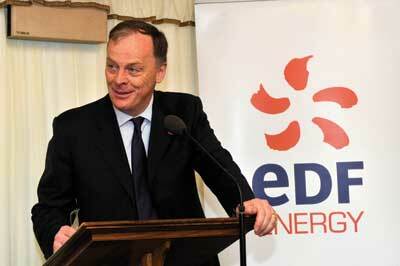 Vincent De Rivaz (pictured right), chief executive of EDF Energy, once again stressed that he believed this would be the case, and added that “it is the right of any Member State to decide their energy mix”. He also said the need for Hinkley Point C – and the security of supply he believes it would bring – was underlined by events in Russia and Ukraine. Talking about the role that power companies have to play in shaping Britain’s energy future, De Rivaz said: “The UK cannot do without investment by the big operators.” He added that the major players “have a role to play in energy research and development to make sure that the UK stays competitive in the global market”. On shale gas, he said that “we have a duty to know” the potential shale market in the UK and added that at EDF “our policy is diversity” and he hoped that shale gas would be part of the company’s future portfolio. The need for nuclear was backed-up by Stephen Tindale, associate fellow at the Centre for European Reform and also co-founder of Climate Answers. He said the UK needed to have a portfolio of power generation that includedonshore and offshore wind, gas, nuclear “and no coal”. Steve Holliday, chief executive of National Grid, used his speech to back the UK government’s overhaul of its energy system under its Electricity Market Reform (EMR) process. “EMR is the right intervention at the right time,” he said, but warned that the current global energy market had lost sight of key goals. Basil Scarsella, chief executive of UK Power Networks, said that 20 years ago “the UK led the world in reforming the energy industry… and the UK is again leading the world on energy policy”. He said the industry was going through “transformative change: how electricity is used, generated and traded is going to change in the future” and the UK – with the package of EMR introduced by the government – was well placed to adapt to these changes. John Lynch, head of EMEA power, utilities and renewables at Bank of America Merrill Lynch, said that the UK “is still one of the best places to invest in energy”. And he stated that “deregulated markets do not deliver what is politically desirable”. Katja Hall, deputy director general of the CBI (Confederation of British Industry), was concerned that “just as policy was beginning to solidify, it is being shaken by political rhetoric”. In the afternoon, delegates heard from both Energy Secretary Ed Davey and his Shadow Cabinet counterpart Caroline Flint (pictured). Davey said that the government had “designed EMR to encourage foreign investment” and Flint stressed that is Labour was to win next year’s general election it would continue the programme of contracts for difference and capacity auctions – and also set a 2030 decarbonisation target, something not yet done by the Conservative-Liberal Democrat coalition. Flint also said that the UK energy market was “neither as competitive nor as transparent as it could be” and said that a price freeze on energy tariffs promised by Labour if it did win the election would “draw a line in the sand” to make energy costs transparent. But Tim Yeo, chairman of the UK government’s Energy and Climate Change Committee, said that “it is misleading for any politician to say that they can control energy prices – because they can’t”. On the dominance of the ‘big six’, he said that “trust will never be restored while we have vertically-integrated businesses”. And he added that building new power stations was “a 20th century solution”, adding that the real answer the the UK’s energy issues in the 21st century was demand side response.